New Hobart MIG comes ready for plug-in spool gun. 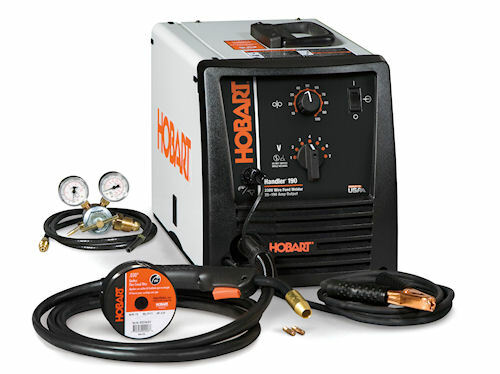 The new Hobart Handler 190 MIG welder comes ready for a plug-in spool gun to give welders access to quick aluminum welding with the company's SpoolRunner 100. The optional spool gun takes the hassle out of "pushing" aluminum wire, and works well with mild steel and stainless steel wires as well. The Handler 190 is capable of operating on 208/240VAC and offers an input range of 25 to 190 amps, allowing welding on 24-gauge material to jobs as thick as 5/16 inch. It also features seven voltage selections and infinite wire-feed-speed control to provide users with greater control of the output parameters for various thickness weld jobs. New Hobart Handler 190 comes ready to use the company's SpoolRunner 100 spool gun for easy aluminum welding from a small-frame MIG machine. The new machine can handle wire sizes from .023- to .035 inch mild or stainless steel; .030- to .045-inch flux core wires, and .030- to .035-inch aluminum wires. The MIG wire moves across dual-groove quick-change drive rolls that make changing wire sizes easy. Also, the 190 provides a 10-foot gun and 10-foot work grounding clamp. Other features include a door chart to provide initial settings for different wires, gases, materials and thicknesses; a built-in gas solenoid valve and dual gauge regulator with gas hose; a sample spool of .030-inch self-shielded flux core wire; and .030-inch contact tips. For more information on the new Handler 190, visit www.hobartwelders.com, or call (800) 626-9420.